The Big Wobble: 4.000 refugees evacuated on the Greek island of Lesbos after a massive blaze swept through a migrants' camp during riots. 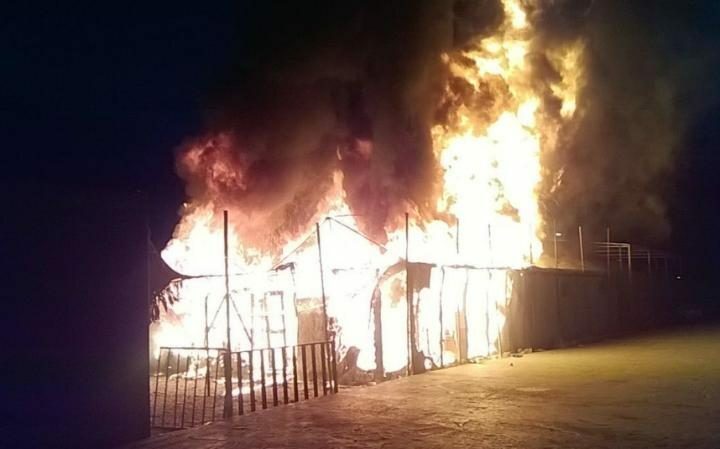 4.000 refugees evacuated on the Greek island of Lesbos after a massive blaze swept through a migrants' camp during riots. Around 4.000 refugees have been evacuated by the authorities on the Greek island of Lesbos after a massive blaze swept through a migrants' camp. "Between 3,000 and 4,000 migrants have fled the camp of Moria" due to the fire, a police source told AFP. According to officials, the blaze has been contained with authorities now working to distribute basic provisions such as water to the affected refugees. Around 150 minors evacuated from the camp were moved to the children's village on the island, a source told AFP. He added that there was "no doubt" that the fire was set off by the inhabitants of the compound. The Moria camp is a key hub for refugees on the island, housing around 5,600 migrants. Prior to the fire, the compound saw two separate protests, one staged by a group of migrants and one by local residents, AFP reports. According to the news agency, citing local media outlets, the rallies turned into riots. The rally staged by the locals was demanding that the authorities clear the camp and deport the migrants. AFP reports that far-right activists had infiltrated the demonstration, shouting anti-migrant slogans and lashing out at officials and refugee helpers. Reports indicate that earlier the migrants discovered they might be deported to Turkey, leading some 300 of them to stage their own rally in protest. However, police intercepted the refugees and sent them back to the camp. Apart from the blaze inside the camp, two more fires were discovered among the olive trees near Moria, but firefighters managed to extinguish them swiftly. Greece is currently housing over 60,000 refugees, located on several islands. Lesbos hosts one of the camps, but the facility has been particularly criticized by human rights groups for being overcrowded and suffering from unsanitary conditions. Government data cited by AFP says that five Greek islands are housing some 13,000 refugees, while originally they were designed to accommodate less than 8,000.